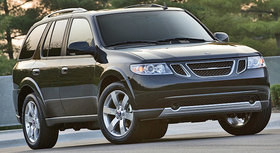 The Saab 9-7X, shown, will be replaced by the 9-4X in the 2011 model year. DETROIT -- General Motors will follow through on plans to provide U.S. Saab dealers with a new crossover, assuming a deal to sell the automaker to a small Swedish company is completed. The 9-4X will be launched in the 2011 model year and will replace the 9-7X, says Steve Shannon, GM's executive director of product and marketing for Cadillac, Hummer and Saab. Meanwhile, on June 12, GM sent new dealership agreements to owners of Saab's 220 U.S. dealerships. Under the agreement, the dealerships would continue selling vehicles under the new owner, a consortium led by tiny Koenigsegg Automotive AB. But the agreement allows for the possibility that the new owner might drop some dealerships. The deadline to sign was Friday, June 19. On June 17, a court ruling in Sweden allowed Saab to cut 75 percent of its more than 10 billion kronor ($1.28 billion at current exchange rates) of debt after creditors gave the go-ahead. The sale to Koenigsegg is expected to be completed in the third quarter. Saab plans to continue the 9-3 and to redesign the 9-5 in 2010. The 9-7X, a lightly reworked Chevrolet TrailBlazer, sold poorly -- just 3,660 units -- in the United States last year. GM's European operations are designing the 9-4X, expected on a front-wheel-drive platform. GM CEO Fritz Henderson said last week that GM "will provide support in terms of powertrain and other technologies." Through May, Saab has sold 4,607 vehicles in the United States, down from 10,196 in the same period last year. Saab sold 93,295 vehicles globally in 2008.